In December 1992, an acquaintance of my sister went to London and offered to buy us some singles while she was there. I wrote down a couple of titles and included this one. A week later, I suddenly had this posterbag edition of Betty Boo's second single off her album 'Grrr! It's Betty Boo'. I can't say I played this single a lot, but it's a nice throwaway pop song. It also includes a musical quote from the Beatles' 'Lady Madonna', by the way. After 'Let me take you there', this was the second and last Betty Boo single I bought. Her career was almost over by that time: she released one more single and then disappeared from the scene - writing song for other acts instead. Betty Boo was born as Alison Moira Clarkson on March 6, 1970. Originally nicknamed 'Betty Boop' for her similarity with the well-known cartoon character, she dropped the 'p' to avoid trademark disputes. In 1989 she rose to the scene with the Beatmasters, singing on their single 'Hey DJ - I Can't Dance (To That Music You're Playing)'. She followed this up with a solo single, 'Doin' the do', which reached number 7 in the UK singles chart. Her debut album sold pretty well too, reaching number 4 in the UK Albums chart. In 1992 she released her second album 'Grrr! 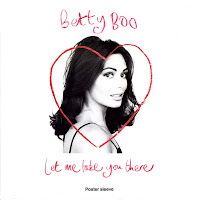 It's Betty Boo', with 'Let me take you there' as the first single. It reached number 12 in the UK, but it didn't chart in the Netherlands. Personally I thought this single was her first decent one, an upbeat summery tune whereas earlier work was annoying house-related trash. I bought the poster sleeved single while on holiday in London.